Purim: Carnivals, Cookies and Candy Sometimes known as Jewish Mardi Gras, Purim doesn't get the same press that Hanukkah and Passover do, but it's twice the fun. Rachel Rappaport shares the story behind the holiday and new twists on old Purim treats. Hamantaschen, a triangular cookie usually filled with prunes or poppy seeds, is a traditional Purim treat. Get recipes for hamantaschen and ginger poppy seed candy. Rachel Rappaport lives, writes and cooks in Baltimore. Her recipe blog, Coconut & Lime, was the winner of the "best original recipes" category in the 2006 Food Blog Awards. 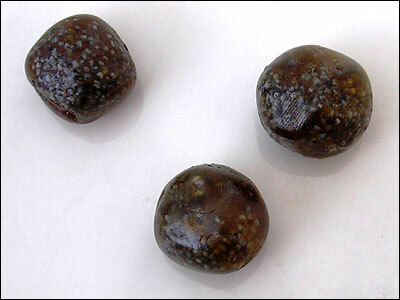 Poppy seeds — seen here in ginger poppy seed candy — are another traditional food eaten at Purim. Purim doesn't get the same press that Hanukkah and Passover do, but it's twice the fun. How can you not love a holiday on which the Torah commands you to drink until you can't tell the difference between "cursed be Haman" and "blessed be Mordecai?" The holiday, which begins Thursday and lasts until March 5, is one of the most joyous on the Jewish calendar and commemorates a time when the Jews of Persia were saved from extinction. It is customary to hold carnival-like celebrations and beauty contests, to perform plays and parodies, and to feast and drink during Purim, which is sometimes called Jewish Mardi Gras. 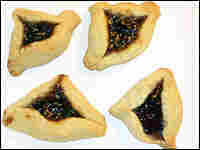 The best-known Purim food is the hamantaschen, a triangular cookie traditionally filled with prunes or poppy seeds. The name comes from the cookie's resemblance to the three-cornered hat worn by the villain Haman. The story of Purim is told in the Book of Esther, a beautiful Jewish woman who is married to the Persian king. An orphan, Esther has been raised by her uncle Mordecai. Haman, an adviser to the king, hates Mordecai, who refuses to bow down to him. Haman plots to execute all the Jews, but Esther reveals the plan to the king — and mentions for the first time that she is Jewish. As a result, Haman is hanged on the gallows he built for Mordecai. This year for Purim, I wanted to try something different with my hamantaschen, even though I love the traditional prune and poppy seed cookies. Recently, there has been wave of "nouveau" hamantaschen stuffed with apples, cranberries, chocolate and even mango. For my 21st-century hamantaschen, I created a recipe that uses a cream cheese-based dough, similar to rugelach, another Jewish pastry. I filled my hamantaschen with fig and ginger preserves, which are sticky and moist enough so the filling does not spread, but also does not dry out. Hamantaschen are rather flat cookies, and using a preserve that is closer to a jam or jelly can prove disastrous, as they ooze and then burn. Since I didn't use poppy seeds in my hamantaschen this year, I decided to make poppy seed candy. I tweaked tradition a bit and used golden syrup — a thick, inverted sugar syrup — instead of the typical honey, and added ginger for a bit of a kick. Poppy seeds are used on Purim because Queen Esther supposedly subsisted for three days on them (and chickpeas) while she worked up the courage to tell her husband of Haman's plan to annihilate the Jews. Other traditional Purim foods include kreplach, a triangular meat dumpling, and a special Purim challah, baked with raisins and whole eggs. Drinking wine is considered a good deed during Purim, but many other alcoholic drinks also are consumed, including schnapps, vodka and slivovitz, a very strong plum brandy. In addition to drinking, people are obligated to give gifts to friends, family and the poor. Gift baskets holding at least two food items are popular ways to fulfill this commandment. Hamantaschen and poppy seed candy would be welcome in any basket. Read last week's Kitchen Window: Chinese hot pot. The cream cheese dough is easy to work with and is a tangy foil to the slightly spicy fig and ginger filling. In a large bowl, cream together butter and cream cheese. Add sugar and mix thoroughly. Add the egg and mix thoroughly again. In a small bowl, combine the flour and baking powder and gradually add it to the butter mixture and mix thoroughly. Refrigerate the dough, in the bowl, for 1 hour or until firm. 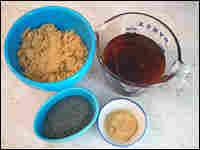 On a lightly floured (or powdered sugared) surface, roll out a small amount of dough at a time to about 1/4 inch thick. If the dough gets warm and hard to work with, refrigerate it for a few minutes and then re-roll. Use a round cookie cutter or the top of a drinking glass to cut out circles. Arrange the cut circles of dough on the cookie sheets. Spoon a teaspoon of the preserves into the center of each cookie. Pinch the edges of the cookies to make 3 corners, but don't seal dough up completely — you want some of the preserves to peek out. Bake 15 to 18 minutes, or until lightly golden brown. Cool on wire rack. *Pre-made fig and ginger preserves are available at some grocery and specialty stores. If you can't find it, or prefer to make your own, mix 3/4 cup fig preserves or jarred fig filling with 3 tablespoons minced candied ginger. Poppy seeds are a popular ingredient at Purim. This recipe strays from the traditional by using golden syrup rather than honey. Golden syrup is a thick, mild-flavored, amber-colored sugar syrup popular in European cooking. It's sold in some grocery stores and many gourmet markets, in the baking isle or near maple syrup. King and Lyle's are two popular brands. Grease an 8-by-8-inch baking dish. Set aside. In a small saucepan, stir together the ginger, brown sugar and golden syrup. Bring to a boil and let boil for exactly 2 minutes, then remove from heat and stir in the poppy seeds. Immediately pour liquid into the prepared dish and allow it to sit 15 to 20 minutes until cool but still slightly soft. Invert onto a cutting board. Cut into 2-inch squares then roll between oiled hands to form a ball the size of a marble. After cooling, eat, package or store in an airtight container.